He comes from a country that has no significant history in the event. That is the territory of Eastern Europe, Scandinavia, Germany. A 19 year old Trini re-writes the form book and history on his second throw in the javelin final. Only the second man from the Western hemisphere to win the event, the last one being Cy Young of the United States, sixty years ago. Forget Bolt, forget Blake. Nothing like this has happened in Olympic field event history. Gerhard: Don’t know him. Where is he from? Gerhard: Let me check him out on the I.A.A.F. website. What have been his performances at Worlds, Grand Prix, Diamond League? Gerhard: I don’t believe you. Kitch, were he alive, would surely be adding “Toco Boy” to “Toco Band” with all due praise to John “Slim” Andalcio who enters the pages of history along with Keshorn. I have left out the story of the Cuban coaching cohort that initially was contracted. It will follow. Awesome congratulations to Ismael Lopez Mastrapas. That is amazing that he won the gold medal with such little competition experience. This is just pure talent and natural ability. I can only imagine what he will be like when he has been competing for a few years. Maybe the next Usain Bolt for Trinidad???? Now, this might start a flashback of investigations, of the likes that did in Casker Semenya of South Africa when she won the 800m. Investigating Bolt and the Jamaicans, the Cubans, the DR athlets, Kirani James, and possible David Rudisha of Kenya, is the sort of thing WHITE PEOPLE DO TO INTIMIDATE African oringinated athletes. By doing this, they cause sponsorships of lucrative products to shy away for our people. When they tried to treat David Rudisha as a new discovery, he calmly told them that his father won bronze in Mexico City in 1968, they must have been focussing on the clenched fists of the two African American athletes. We, in celebration of our uniqueness- the survivors of the Middle PAssage- must immediately create a list of products we would not buy, because they sided with those who attempted to impugn our dignity as people. 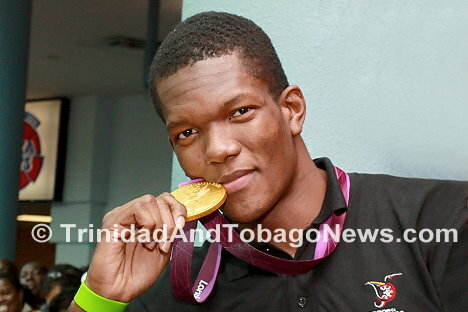 Trinidad and Tobago has been winning Olympic medals since McDonald Bailey. A slow progression to excellence, constantly moving forward. I could hear the Holy Sh.t of the detractors when he won, and this event was not carried on the regular NBC coverage. They did not expect him to win. Now, if they look at the almost wons- our swimmer, our cyclist,our hurdler, our women’s teams, they would see that something positive is happening in the Caribbean among athletes, from the Bahamas to Trinidad and Tobago. Instead, the attitude of the ruling committees seems to be “How dare they come in and win so many medals?” 34 if you include the two won by the D.R. White,(European and North American) might, money, like to “discover” us first, and then watch us win with tales of hardship and deprivation spicing up the narrative. They get pissed when we win without their permission. Let us not forget, that this young man is the end product of thousands of years of spear throwing by African wariors from the Nuba, the Massai and the Yoruba. Go Kershawn, Go on to greater glory. Again Linda you writing your racist nonsense, when will you celebrate without beating up the white man who created the Olympics???? Let us hope you include banned substances and steroids on that list, because many experts agree that people like Marion Jones and others would have won anyway without the use of illegal substances. Living in Trinidad ,not a Trinidian ,my heart ,amother,s heart,and a sports,lover,s heart ,puffed with pride and love for this unassuming and classy barely a man ! I wish that he continue to use his talent for his country ,family and sports lovers like millions of people round the world . God bless u son !!!! Son, I sorry I misspelled your first name. Should have been Kershorn. The poem I wrote to celebrate you would be sent to your family by a friend in TnT. Congratulation Keshorn Walcott! You have brought happiness to many hearts. Continue to be positive. You know what you are about. Your achievement is magnanimous. So, you, TMan, want me to include Cerasee Tea(carailie) breadfruit, dasheen, oildown with coconut, fresh fish from our own waters,green bananas- the things we eat and stay strong on the banned list, because they may give us an edge? Right after the event, athletes are given a piss test. If they were taking substances they are not supposed to, it will show up. Trouble with the IOC(Same group that four years ago thought Bolt was celebrating too much, remember?) is that if Carailie bush tea cleanses your blood and enhances performances, what residue they will check for? Do the know Carlie? Now, was there some substance that Dr. Castro cooked up and shared with fellow Caribbean people that helped Jamaica, Bahamas, TnT, Grenada and The Dominican Republic to also win Gold? Venezuela got one also. Very suspicious. Mexico defeated Brazil in soccer. What is it in these CAribbean waters? No wonder they are upset, searching rooms after everybody gone, looking to anaylse spit from the wash-basin? Contents of the trash can? Stupid. They are stunned at our medal count, and would do anything to cast suspicion on our athletes. Remember Casker Semenya of South Africa? They beat her down by saying she was a man. Test after test proved she was a female, as her mother said she was.. You have to remember that while Hitler at the 36 Olympics, had proclaied the superiority of the White Race, many others continue to beleive it, and so, when these poor little ex-slave colonies come out ahead of the game., something MUST BE WRONG. They need to Haul dey Ar.e. They need to accept that the Davids of the sports world can slay the Goliaths. You need to accept that too. No one is making accusations, but be cautious. Go to website above and notice that doping is an international problem. This is the Athletics list. Many of the names will surprise you! My point, Tman, is this, and simply this: I am famous. I have done something significant for the second spectacular time. I vacate my “House”given to me for a three-week period, and go to my permanent residence. The IOC begins searching through the rubbish left behind after a successful party. They begin their search, apparently, after I am gone. Who knows who had access between my leaving and their looking? Souuvenir hunters, trash planters? Before they know anything for sure, they are saying they found something.I am already Black, why try to tar me ina hurry? because it will stick easier on African originated people? That’s like a doctor, giving me a blood test forty years ago,in the US noted “various foreign antibodies” in my blood. He did not recognize the antibodies for polio, smallpox and tuberculosis, all of which I was innoculated against in Trinidad, before I was fifteen. Some doctor, huh? In the forty-plus years I have lived abroad, I have seen all kinds of asinity, masked in racism. Strangely enough, the US swimming coach had a lot to say about the sixteen year old Chinese female swimmer, but nothing to say about the Amrican fifteen year olds who won gold. You have not addressed the obvious racism implied in the whole situation. The suspicions raised by the media during the Olympics and even afterwards can be described as racist. They seem disappointed that non white athletes could do so well. Many of the judges’ rulings in boxing were questionable as victories were awarded to athletes representing establishment countries.So I do agree with you. Fortunately, in track and field there is no subjectivity and no one can dispute that gold medal javelin throw. Suspicions are also fuelled by the athletes themselves because they know which athletes are tampering with banned substances. Most suspicions have proven to be true over the years.